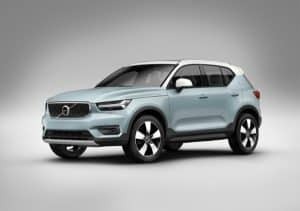 The new Volvo XC40 has secured impressive residual values with guides Cap Hpi and KeeResources placing Volvo’s first compact SUV ahead of its two main premium German rivals, the Audi Q3 and BMW X1. After three years on the road and 60,000 miles on the clock, an entry-level manual XC40 D3 diesel was estimated to be worth 43 per cent of its new ticket price, according to Cap Hpi, rising to 46 per cent in KeeResources’ opinion. That outshines the equivalent Audi Q3 Sport (36 and 42 per cent) and BMW X1 SE (38 and 44 percent). Switching to petrol benefits the XC40’s residuals even further with base-level T3 models predicted to recoup 45 per cent of their original ticket price after three years and 60,000 miles, according to both value guides. Meanwhile, Cap Hpi predicted the petrol BMW X1 SE would recoup 33 per cent of its price at new, with the equivalent Audi Q3 Sport achieving 39 per cent. Graeme Oswald, remarketing and total cost of ownership manager at Volvo Car UK, said the XC40’s strong residual performance followed suit with the flagship XC90 SUV. “Our larger 90 series cars, as well as the new XC60, have paved the way for these strong residual values, and it’s a fantastic achievement that our new compact SUV has been so well received by the industry,” he commented.